A: The experts will wash your windows with risk-free water-fed pole gear or use secure ropes and cherry pickers to clean high buildings. 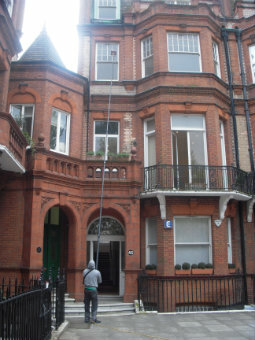 We also offer inside window cleaning in Westminster, carried out with the standard ladders and squeegees. A: This useful allows the Westminster window cleaners to wash any skylight, sash window, French door, and other pane varieties on any four-storey home or office. A: It's simple – we won't rinse your windows with normal tap water. Instead, the adepts will remove the dirt build-ups with filtrated water that won't tarnish your panes once it dries up. Q: Do I need to prepare beforehand for the Westminster window cleaners' arrival? A: You'll need to book an empty parking space within 30 metres from your property and on the same side of your road. You'll also need to provide the specialists with full access to your property. A: Yes, our services are covered by a comprehensive insurance policy. In addition, the pros are certified to treat windows big and small, single or double, as well as French doors, door panels and even glass roofs. A: We will readily treat any four-storey or multistorey commercial premises. We can also supply you with other maintenance alternatives, such as gutter cleaning and pressure washing. With our window cleaning in Westminster, you get a quality rinse of your sash windows, skylights, conservatory roofs, French doors, and other glass surfaces at modest prices. We will even provide you with a free of charge polish of all PVC & UPVC ledges and frames! For a detailed list of our prices, please see our price table below. We've created our window cleaning in Westminster with usefulness in mind. As a result, our service is now frequently hired by business and household customers alike. Let's have a look at our window washing choices on offer. With our outside cleaning, you can effortlessly polish the windows of any building with four or less floors. The proven technicians will appear in a cleaning caravan. The window cleaners in Westminster will then attach a convenient water-fed rod to the van's water container. The special filtrated water will be released through a brush-head add-on at the pole's end under powerful pressure. When the fluid evaporates under the sun, your glass façade will stay smudge-free for weeks to come. For properties above the fourth storey, we'll dispatch experienced climbers for rope access window cleaning. Carrying durable ropes, cherry pickers, and ladders, they will assess and renew any high-rise domain over the course of one afternoon. Should you request risk assessment reports, we'll readily provide them for you. We also take our job very seriously and will follow all safety regulations. If your windows are smudgy on the inside as well, the cleaners can carry out inside cleaning with ladders and squeegees. Over time, we've answered the cleaning calls of clients from many neighbouring regions. As a direct result, we widened window cleaning Westminster's horizon and you can now witness our washing caravans in the locations below. Another quick and easy way to get a free instant quote or to book window cleaning services Westminster W is through our web site.